Third time was a charm. In the third Final Four under coach Zeljko Obradovic Fenerbahce became the first Turkish team to win the EuroLeague. 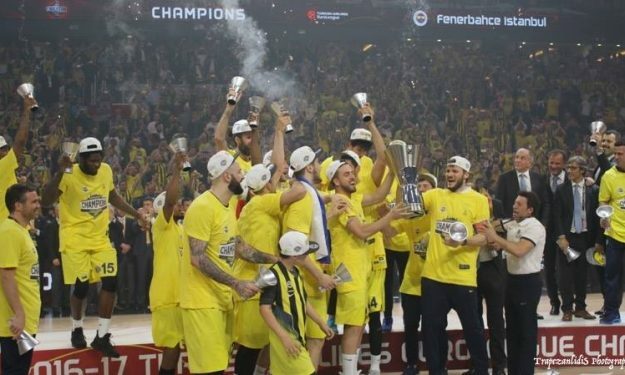 Against a worthy opponent like Olympiacos, the hosts of the Final Four got the 80-64 win and their first EuroLeague title which is also the first every for a Turkish club and ninth in total in the amazing career of coach Obradovic. Ekpe Udoh had one more amazing all around game (10 p., 9 r., 4 as. 5 bl.) and together with Nikola Kalinic (17 p. 5 r. 5 as.) led the charge for the hosts, while Bogdan Bogdanovic also scored 17 points. Fenerbahce started the game with a 16-8 partial score in first five minutes and Kalinic scoring more points – nine – than Olympiacos. The Reds tried to change the momentum with their defense, however the score at the end of the the first period was 26-18 thanks to a buzzer beater by Bogdanovic and 12 points by Kalinic. The Reds used their bench and managed with a 5-1 run to make it a four-point game (27-23) but couldn’t buy a bucket and couldn’t score in transition. Fenerbahce led even by 10 (35-25) with four minutes left in the first half, still Olympiacos closed the second quarter with a 9-4 run after two threes, one by Giorgos Printezis and one by Vangelis Mantzaris, and a buzzer beater by Khem Birch who had 10 points in nine minutes of action. The halftime score was 39-34, Bogdanovic has also scored 10 points until that point and everything was still open. With Mantzaris having 3/3 threes Olympiacos made it again a four-point game (44-40) at the start of the third period. The answer was a 13-4 run which was completed by a three by Gigi Datome and a 57-44 lead for Fenerbahce. The last quarter started with Fenerbahce having a 60-48 lead after a big block at the buzzer by Udoh and continued with an 8-2 run (68-50) that practically ended Olympiacos’ hopes for a come back. Birch with 14 points and Milutinov with 10 did their best, but Vasilis Spanoulis (2/12 FG), Giorgos Printezis (3/9 FG) and Kostas Papanikolaou (1/9 FG) had an off game and the night belonged to the hosts which led even by 19 (73-54).